Last year was worldwide the hottest year ever. And this year will probably be even warmer. At least, that’s what the British Met Office said last December, and with the record-breaking heat of the past three months they haven’t been proven wrong so far. Normally, scientists are hesitant with such predictions. But then again, this year isn’t a normal year: A strong El Niño is in progress which sets climate change in a higher gear. El Niño receives a lot of media attention. The phenomenon is often connected to a surge in droughts in parts of North America, Southeast Asia and Africa. Because of these droughts, the UN warned a month ago for a worldwide food crisis as a result of El Niño. Droughts also lead to more forest fires, like the ones that plagued Indonesia last year. Stifling smoke stretched until Malaysia and in a few weeks’ time more CO2 was emitted than Germany does in a whole year. Still, it’s not just droughts that follow an El Niño. In California they are, at the moment, expecting floods as a result of this weather phenomenon. A recent study in Nature Microbiology even suggested that a strong El Niño could lead to a wider spread of diseases such as cholera, since bacteria were hypothesized to lift along the warmer ocean currents. So El Niño is annoying, that much is clear. But what is it? To start with the name: This originates with Peruvian fishermen, who recognised the phenomenon already in the 17th century. «El Niño» is Spanish for «the small boy», and these religious fishermen referred with that name to the baby Jesus. They noticed that the fish catch was worse in certain years, right around Christmas, at the same time as the arrival of warm seawater in front of the South American coast. Because of the lack of nutrients in this water, there is less fish, and therefore El Niño ushers in the end of the fishing season. These days, however, we don’t distinguish an El Niño event by the amount of fish that is caught. An El Niño is officially in progress when a specific part of the Pacific Ocean between Indonesia and Peru is abnormally warm. Normally, the trade winds in this part of the world blow westwards, away from the South-American continent. Because of this, cold water can well up in front of the coast, since warm water is driven away towards Indonesia. But in some years, these winds weaken, or even turn eastwards. In that case, warm water is given free rein. With satellites, this is clearly visible as a band of warm water stretching along the equator from South America across the ocean. Such a widespread area of millions of square kilometres with exceptional temperatures has a large influence on the atmosphere. There is more evaporation in this area, which e.g. leads to more precipitation in South America, and the added heat changes weather patterns as far as Alaska or the Southern part of Africa. But the influence of El Niño also has its limits. Europe is far away from the Pacific Ocean, and a strong relationship between El Niño and the weather in our part of the world has so far not been shown. Also, the current, absurdly strong, warming of the Arctic has little to do with this weather phenomenon. 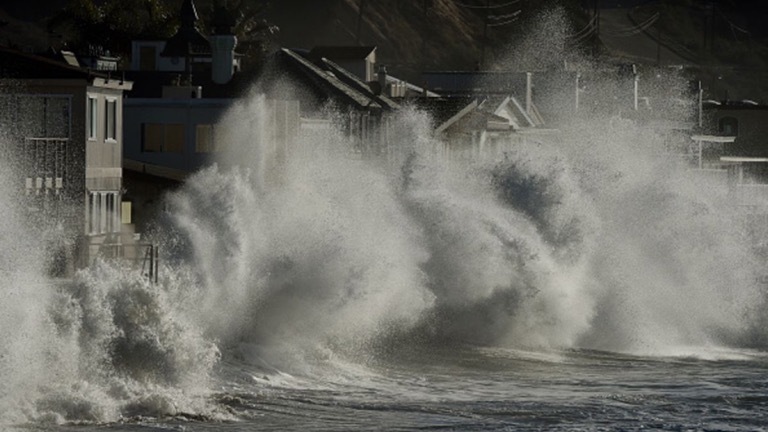 El Niño strikes: Waves roll hit houses near Mondo Beach in California, in January of this year. The phenomenon leads to extreme weather over large parts of the globe. So we need to take care not to attribute everything to El Niño whenever we feel like it. But the opposite often happens in the climate debate: El Niño is ignored to cast doubt on global warming. How does that work? So far this century, we mostly had weak El Niños, and, not unimportantly: we have dealt several times with his sister, La Niña (the little girl). La Niña is a comparable phenomenon, but when she is present, trade winds are stronger, more cold water appears at the surface of the Pacific, and world temperatures become lower rather than higher. If you plot land surface temperatures of the past 50 years in a graph, it is clear that years with an El Niño are above the trend line (warmer), and years with a La Niña below it (cooler). 1998 is the highest above the trend line. In that year, a very strong El Niño boosted worldwide temperatures. It’s still one of the hottest years on record. But that extraordinary year has been misused ever since by climate sceptics: they calculate trends in world temperature with 1998 as the starting point to claim that we’ve had no warming – even though all years since 2001 are among the hottest ever. It is clear to everyone that in order to do sound statistics, you should not focus only on outliers. The entire picture has to be considered. When you do that it’s obvious that El Niño and La Niña only cause short-lasting variations on top of an undeniable warming of the earth in the long term. Besides, the current El Niño is even stronger than the one in 97/98. In combination with ongoing climate change, 2016 is therefore well on track to break the myth of a lack of warming for good: February was already 1.35 degrees Celsius warmer than normal, right below the hoped-for lower limit of 1.5 degrees that was agreed upon in Paris last December. In this way, the climate enhancing effect of El Niño provides us with a view of what will be the new normal in the future. Let’s hope that his little sister will still often enough provide us with some cooling.